A nonlinear static analysis methodology for the derivation of a set of pushover curves for any angle of incidence of the seismic action (multidirectional pushover curves) for bridges is developed, wherein the interaction between axial force and biaxial moments at critical pier sections or biaxial shear forces at the bearings is taken into account. Dynamic pushover curves (base shear vs. peak deck displacement) for arbitrary angle of incidence of the excitation, are derived for both unidirectional (single-component) and bidirectional (dual-component) ground motion. It is found that neglecting the minor horizontal component leads to underestimation of bridge response, especially along the bridge principal directions and that the angle of incidence of bidirectional excitation affects bridge response, but to a lesser extent than in the case of unidirectional excitation. The proposed procedure is then applied to a straight symmetric bridge, its results are checked against those from response-history analysis, and is found to be sufficiently accurate for practical application. 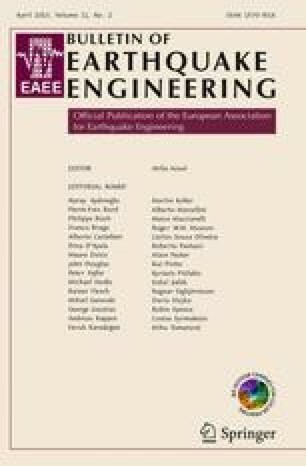 Using the derived results it is also found that the design of the selected bridge is safe since for the design bidirectional earthquake the bridge starts to behave inelastically (the first plastic hinge forms), while its failure occurs for about four times the design seismic action.